On February 24, 2018 ULTRA Worldwide will touch down on its sixth continent to date, for the debut edition of Road to ULTRA Australia. This event will mark the start of an ambitious agenda for Ultra in Australia, having already confirmed plans for full-scale festivals in Sydney and Melbourne in 2019. With the Sidney Myer Music Bowl in Melbourne confirmed as the venue for this highly anticipated inaugural Road To ULTRA event, the Phase One Lineup can now be revealed. 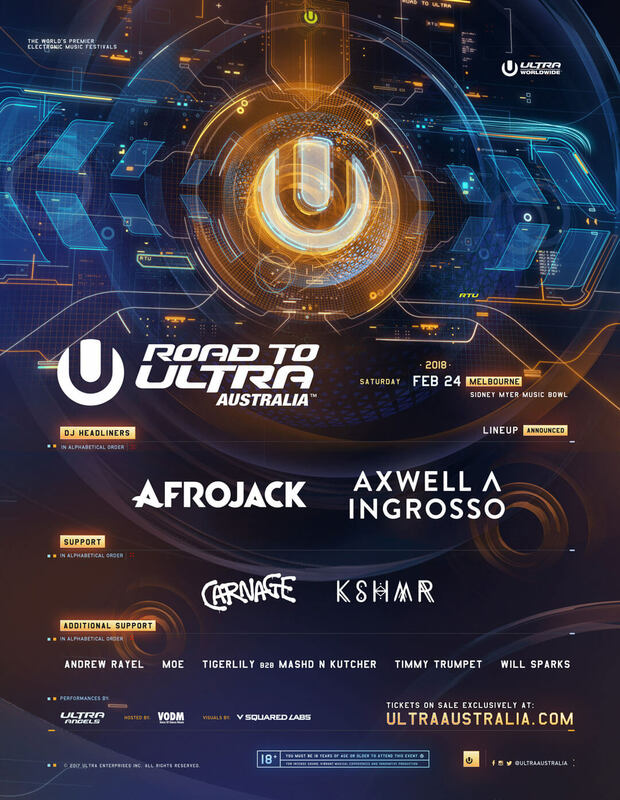 Headlining Road To ULTRA Australia in early 2018 will be two of the most sought-after acts in dance music right now – international touring superstar and Jacked label boss Afrojack, and iconic Swedish hit-makers and firm ULTRA favorites Axwell Λ Ingrosso. International support will come from Carnage, KSHMR and Andrew Rayel. Rounding off an impressive first year lineup announcement, are a host of local and international acts including Moe, Tigerlily b2b Mashd N Kutcher, Timmy Trumpet and Will Sparks. Taking place just one month before Ultra Music Festival’s twentieth anniversary in Miami, these five acts will follow in the footsteps of some of music’s biggest ever stars including ABBA, Bob Dylan, Daft Punk and Sir Paul McCartney – all of whom performed at this iconic venue. With a capacity of up to 18,000, the Sidney Myer Music Bowl was specifically chosen for its central waterside location by the Yarra River and stunning views of the Melbourne Skyline. The Road To ULTRA Main Stage will be positioned underneath the Bowl’s canopy, with organisers set to build one of their most creative stage designs yet. Road to ULTRA events are single-stage events with the same focus as all ULTRA Worldwide festivals. Each event showcases cutting-edge stage production including A-list talent, world-class visuals, lighting, cryogenics and pyrotechnics. Stage designs are developed by the ULTRA Music Festival creative team and adapted to accommodate the requirements of both indoor and outdoor venues. Fans can also look forward to 2019, where Ultra will run two full-scale, multi-stage festivals in both Sydney and Melbourne. Stay tuned to ULTRA Australia’s socials for further information.